Just regular folks. : We're trapped! Spent the day shoveling out from under the snow. Jeremy had shoveled twice yesterday and said that he was pretty sore, so I did the last shoveling today - only about 6 inches worth, but it's light and fluffy, so it wasn't so bad. I felt virtuous all day and had extra helpings of lunch and dinner because of it. 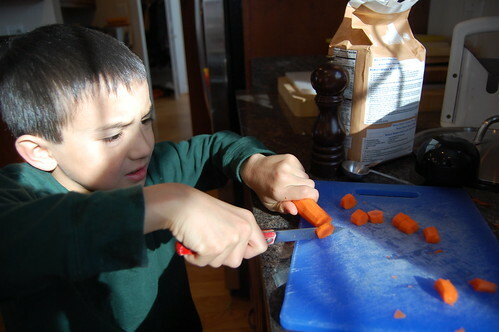 Vince learning to use a knife. Ack! Wow, Vince is so big! Happy holidays Doris, and I hope to see you soon! Cute post! I like snow shoveling, and always feel a virtuous glow the rest of the day, too. And when I saw the knife photo my first thought was ACK! I still feel that way sometimes with my just turned 13 year old. Jeremy teach that child to curl his fingers so you don't have fingers carrot soup!! So cute. Wish we had some snow. It is hot here. We miss you. Favorite part of the year! Interesting books that come in the mail. And the weekend is over. Getting ready for the holidays.